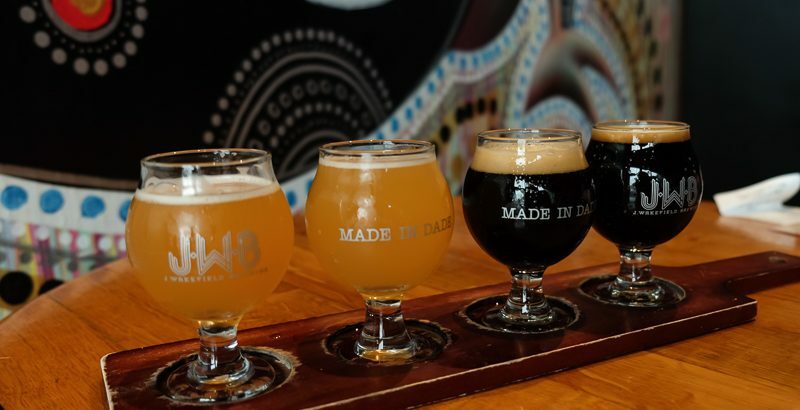 After our visit to Concrete Beach Brewery and lunch at Coyo Taco, we decided to check out one more brewery in the Wynwood district before heading to campus for a University of Miami basketball game. It was down to Wynwood or J. Wakefield, and quite honestly, we picked J. Wakefield because our car was parked near there, and it was super gross out for these northerners. Parking our car a few doors down from J. Wakefield was serendipitous, because J. Wakefield turned out to be awesome! It was (and still is) my favourite brewery in Florida. I’m forever drooling over the beers they are releasing, which I know about from following them on Instagram. 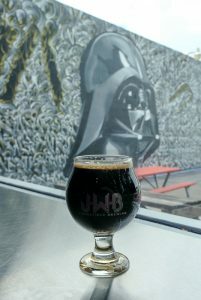 This weekend, on my birthday, they have a Game of Thrones-themed stout with vanilla and marshmallow. Guuuhhhh. Anyway, it was so great that we went back the next day, too. On a Sunday afternoon in November, J. Wakefield wasn’t terribly busy, but the bar was full. We chose four beers for a flight and I let the fella handle ordering it while I chose a photogenic table near the big windows in the front. They also have an outdoor seating area, but we preferred the comfort of the air conditioning inside. The outdoor area is a great place for larger groups to hang, though. 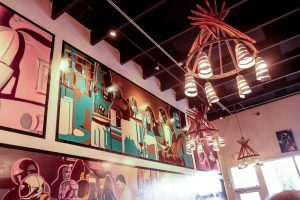 The decor both indoors and outdoors has work from local artists, most of which has a Star Wars theme. Inside around the bar, they also have posters of “cover art” from past brews. 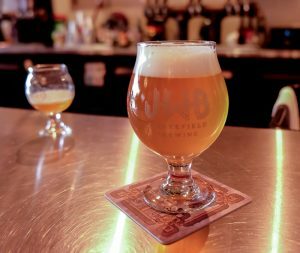 They are always experimenting with new brews and they often collaborate with other breweries, both near and far. 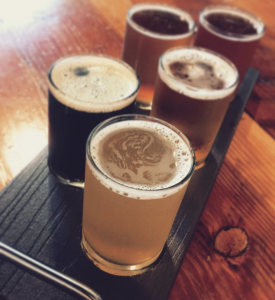 You can check out the tap room’s current menu on Untappd. Also: their flight glasses are super cute and say “Made in Dade” on one side, referencing Dade County. I wish we’d bought one! 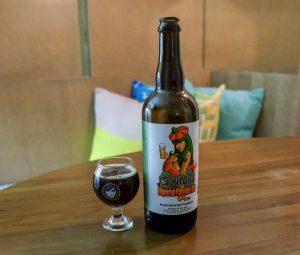 We bought a bottle of Barrel-Aged Gourdita (pumpkin beer) and poured it later that night at the hotel. I love pumpkin beers and was so dismayed that we hardly found any in California last fall. So even though the weather was anything but crisp and autumnal, we just cranked the A/C in our room and savoured this delicious beer. This was agey and boozy and burned a tiny bit and was full of delicious pumpkin. Fella and I both wavered between giving it 4.75 or 5 stars. I apparently settled on 4.75 and fella on 5, but regardless, we both loved it. Our flight the next day wasn’t until late that evening, and we’d had such a great time at J. Wakefield that we decided to go back. I had read about how owner and head brewer Jonathan Wakefield got his start as homebrewer that become known for his fruited Berliner Weisses. We hadn’t actually tried the one on tap, so we had to go back and rectify that. Even on a Monday afternoon, there were a few people in the brewery. We snagged two bar seats and ordered a couple of beers that we had missed on Sunday. We also split a taster-sized pour of Welcome to the Thunderdome again, just because it was that good the first time. Aaaand we bought another bottle of BA Gourdita, because I wanted to bring one home and age it for a year. Can’t wait to try it again this fall! 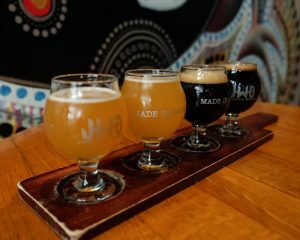 Overall, J. Wakefield Brewing was a delightful surprise in Miami. It’s well known on the beer scene in Florida, apparently, with long lines all but guaranteed when they go to local beer fests, but it was brand new to both of us. I’m not sure if this is scientifically accurate, but fella always maintains that Florida beers that are lighter in colour suffer because of the water quality in the state. We were both really pleased to find some light-coloured beers that were over 4 stars for us, but the dark beers were the true stars. I wasn’t a big fan of Miami when I went to school there and went 13 years without visiting, but I also like sportzball a lot and have turned the fella into a fan. So the next time we’re in town to cheer on the Hurricanes, you can bet that J. Wakefield will be one of our first stops. Disclaimer: Fella works in the alcohol industry, and we might have received an industry discount here, but I can no longer remember. Copyright © 2019 Rhapsody in Brew. All Rights Reserved.